Andhra Pradesh Police Department conducts examination for recruitment of Stipendiary Cadet Trained Police Constables (Civil & AR) (Men), Stipendiary Cadet Trinaee Police Constables (APSP) (Men), Constables (Men) in Special Protection Force (SPF) Department, Firemen in AP Fire & Emergency Services Department, Stipendiary Cadet Trainee Police Constables (Civil & AR) (Women) in Police Dept. Intermediate is the minimum qualification to apply for these posts. 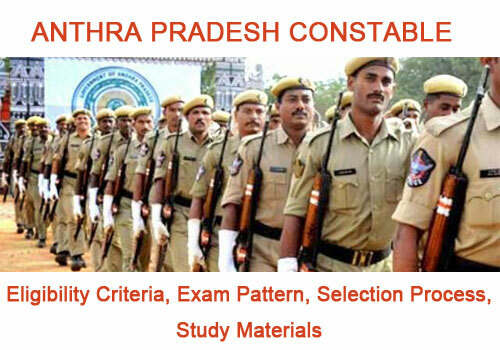 Here provided AP Constable exam Notification, Guidelines & Instructions for online apply. I. Age Limit: Candidates age limit for Police Constable for different cadres as given below…. v) 3 years in addition to the length of service rendered as a whole time Cadet Corps Instructor in NCC provided the candidate rendered a minimum service of 6 months as a whole time Cadet Corps Instructor in NCC. III. Minimum Educational Qualification: The candidate must hold, Intermediate or its equivalent examination recognised by the State Government. In the case of a candidate belonging to Scheduled Castes or Scheduled Tribes, he/she must have passed SSC or its equivalent examination recognised by the State Government and should have studied Intermediate and appeared for the Intermediate Examinations in both the 1st year and 2nd year. in Police Department Height: Must not be less than 167.6 cms. Police Department Height: Must not be less than 167.6 cms. 4. Constables (Men) in Special Protection Force (SPF) Department Height: Must not be less than 167.6 cms. 5. Firemen in A.P. Fire & Emergency Services Department Height: Must not be less than 167.6 cms. 2. The candidate should possess sound health and be free from any bodily defect or infirmity which will render him unfit for police service. Andhra Pradesh Police Constable Exam will consists of Preliminary Selection Test, Physical Efficiency Test (PET) and Written Examination. in Police Department Candidates will have to run five (5) kms within 25 minutes. 2. Stipendiary Cadet Trainee Police Constables (AR) (Men) in Police Department Candidates will have to run five (5) kms within 25 minutes. 3. Stipendiary Cadet Trainee Police Constables (APSP) (Men) in Police Department Candidates will have to run five (5) kms within 25 minutes. 4. Constables (Men) in Special Protection Force (SPF) Department Candidates will have to run five (5) kms within 25 minutes. 5. Firemen in A.P. Fire & Emergency Services Department Candidates will have to run five (5) kms within 25 minutes. 6. Stipendiary Cadet Trainee Police Constables (Civil) (Women) in Police Department Candidates will have to run 2.5 kms within 16 minutes. 7. Stipendiary Cadet Trainee Police Constables (AR) (Women) in Police Department Candidates will have to run 2.5 kms within 16 minutes. Candidates in each event will be awarded maximum 15 marks. All the five (5) items put together will carry 75 marks. III. Written Examination: Candidates who qualify in the Physical Efficiency Test will be required to appear for a written examination for three hours duration. Questions will be objective in nature and will be set in English, Telugu and Urdu languages. However the questions relating to ‘English in the syllabus’ will be set in English only in the ‘Telugu’ / ‘Urdu’ version of the question paper also. Candidates have to answer the questions on an OMR answer sheet using Blue / Black Ball Point Pen only. For this purpose candidates should bring Blue / Black Ball Point pens along with them. I. Preliminary Selection Test: In selection test, candidates have to run for 2.5 Kms within 16 minutes for Stipendiary Cadet Trainee Police Constables (Civil, AR) (Women) in Police Department and run for Five (5) kms with in 25 minutes for remaining all posts. III. Written Examination: Candidates who qualify in the Physical Efficiency Test will be required to appear for a written examination for maximum of 200/100 Marks in three hours duration. The minimum marks to be secured by a candidates in order to qualify in the written examination is 40% for OCs; 35% for BCs; and 30% for SCs/STs and Ex.Servicemen. (i). For Stipendiary Cadet Trainee (SCT) Police Constables (Civil) (Men), Firemen in A.P. Fire & Emergency Services Department & Stipendiary Cadet Trainee Police Constables (Civil, AR) (Women) in Police Department: The final selection will be strictly on relative merit of the candidates in each category, as obtained by them based on their score in the written examination out of a maximum of 200 marks. (ii). For Stipendiary Cadet Trainee Police Constables (AR) (Men) in Police Department: The final selection will be strictly on relative merit of the candidates in each category, as obtained by them based on their score out of a maximum of 175 marks in physical efficiency test (75 marks) and written examination (100 marks). (iii). For Stipendiary Cadet Trainee Police Constables (APSP) (Men) in Police Department & Constables (Men) in Special Protection Force (SPF) Department: The final selection will be strictly on relative merit of the candidates in each category, as obtained by them based on their score out of a maximum of 175 marks in physical efficiency test (75 marks) and written examination (100 marks). As per the provisions of “The Andhra Pradesh Public Employment (Organisation of Local cadres and regulation of direct recruitment) Order, 1975”, the rule of reservation to local candidates is not applicable. Syllabus (Intermediate Standard): All the Questions in the examination are of Objective Type. Total number of questions are 200.